Wolo - Challenger EV Roof Mount Air Horn | Best Roof Mounting Air Horns for Trucks | Big Semi Rig Truck Horn | California Car Cover Co. The Wolo Challenger EV Air Horn has a powerful big rig air horn sound. Comes complete with a maintenance free on board air system. 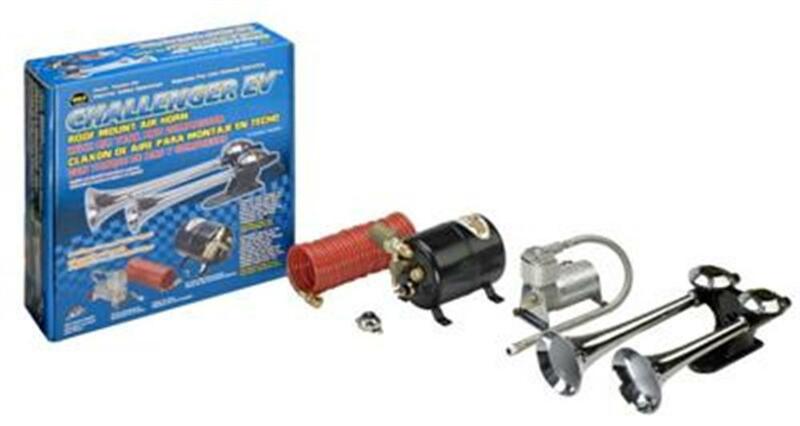 The kit includes a deluxe air horn that is all metal with triple chrome plated trumpets, heavy duty compressor, tank, hoses, mounting hardware and instructions. All moving parts of the air compressor are manufactures to precision tolerances. The compressor's motor is computer balanced, reducing noise and vibration. The trumpets are built on a heavy mounting base that secures to the vehicle using four rust resistant stainless steel bolts. Kit also comes with 20 feet of plastic coiled hose with air fittings to inflate shocks, rafts or any other application requiring air. All necessary mounting hardware, hose and fittings included. Horn size: L 17 in. x W 7 in. x H 5 in. Compressor size: L 6-1/8 in. x W 3-1/2 in. x H 5-1/8 in. Tank size: L 9 in. x W 5 in. x H 5-3/4 in. Learn more about the Tiger Air Tank & Compressor by searching part # 800 on our website.